388 pages | 7 Color Illus. | 41 B/W Illus. The genus Phyllanthus has over 1,000 species distributed worldwide, many of which have been used indigenously for the treatment of a variety of ailments for generations. Researchers have developed ways to analyze the potential of these plants and demonstrated the pharmacological action and various chemical entities present in each of them. They have validated the folklore claims and used this knowledge to design cost-effective and reliable sources of medicine. 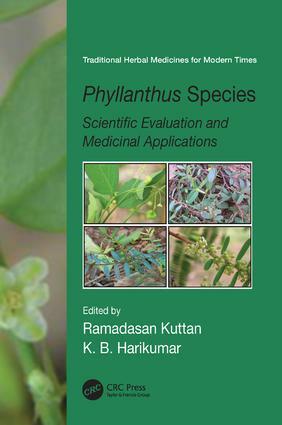 The first book to exclusively examine the genus Phyllanthus, Phyllanthus Species: Scientific Evaluation and Medicinal Applications begins with a systematic classification and identification manual for various plants in the genus, followed by the scientific evaluation of the species for modern medicinal use. This reference compiles cutting edge research from countries around the world, including the UK, Malaysia, India, Indonesia, Spain, Cuba, and China. Topics covered include phylogenetic analysis of Phyllanthus, chemistry of the genus, anti-cancer, anti-diabetic and chemo- protective effects, genotoxicity, clinical trials involving Phyllanthus, and various formulations containing different plants from the genus Phyllanthus. Phyllanthus Species: Scientific Evaluation and Medicinal Applications describes in detail the taxonomy, cultivation, and marketing, identification of geographic and genetic hot spots, chemistry, scientific evaluation, and clinical trials of various species of Phyllanthus. Written for researchers and educators in academia, industry, agriculture, and the interested general public, this book’s up-to-date references make it a powerful resource providing first-hand information on Phyllanthus. Chemoprotective, Genotoxic, and Antigenotoxic Effects of Phyllanthus Sp. Triphala: An Ayurvedic Drug Formulation. Ramadasan Kuttan, Ph.D., has worked at the Amala Cancer Research Center, Thrissur, Kerala, India since 1984 and presently is the Research Director of the Center. He earned his doctoral degree from the University of Madras in 1973, receiving a Gold Medal for the outstanding thesis of the year. From 1973 to 1984, he conducted research in the United States, including stints at Roche Institute of Molecular Biology, Nutley, New Jersey, and M. D. Anderson Hospital and Cancer Center in Houston, Texas. His major areas of research include cancer drugs from plant sources and chemoprevention, chemoprotection, radioprotection, immunomodulation, and the like. He has done extensive work on the use of Phyllanthus amarus in cancer using animal models and cell culture. K. B. Harikumar, Ph.D., received his bachelor’s and master’s degrees in biochemistry from Nagpur University in India. His doctoral research on cancer chemoprevention by natural products was conducted under the direction of Dr. Ramadasan Kuttan at Amala Cancer Research Center, affiliated with Mahatma Gandhi University at Kottayam in India. Presently, he is a postdoctoral associate in the Department of Biochemistry and Molecular Biology at Virginia Commonwealth University, Richmond, Virginia. He has over 40 peer-reviewed publications and several book chapters to his credit. His major research focuses are cancer chemoprevention, ubiquitination and nuclear factor kappa B signaling, and the role of bioactive lipids in cell signaling.